Let me get this out of the way first: Yotsubato! has no story. It is not “about” anything. There is no point. It does not go anywhere. The manga could be classified as falling within the genre of comedy, but it doesn’t really try to be funny. The reader never really learns anything about the characters, and the relationships between the characters show almost no development. Nothing important or exciting happens. Let me also get this out of the way: Yotsubato! is one of my favorite manga in the whole wide world. I have been fond of Azuma Kiyohiko’s four-panel manga Azumanga Daioh ever since the translation was released in America in 2002. I also enjoyed the anime based on said manga. When defunct American manga publisher ADV Manga started releasing translations of Yotsubato!, Azuma’s new project following the completion of Azumanga Daioh, I picked up the first volume immediately. Unfortunately, I found myself disappointed. It wasn’t a fun manga to read. I didn’t get it. The dialog was translated in a way that was supposed to be wacky and zany, but I didn’t think the manga itself was that funny. The art was a little weird, too. A year later, in 2007, I went to Japan to find Yotsubato! featured prominently at almost every major bookstore in Tokyo and Yokohama – most memorably at the Tsutaya in Shibuya, which had an entire wall devoted to Yotsuba paraphernalia. The cover of the Japanese publication of the manga was approximately five hundred times more appealing than the cover of the translation, so I picked up a copy. While reading it on the train home, I fell in love. Yotsubato! follows the daily life of a five-year-old girl named Yotsuba. Having been orphaned on an island somewhere outside of Japan (the circumstances are never made clear to the reader), Yotsuba has been taken in by a man named Koiwai, who seems to be in his late twenties or early thirties and makes his living as a translator. At the beginning of the first volume of the manga, Yotsuba and her adopted father move into a new house in the suburbs of a city assisted by Koiwai’s friend Jumbo, a florist with a preference for Hawaiian shirts whose name reflects his comically enormous stature. After moving in, Yotsuba and Koiwai (and Jumbo, who visits from time to time) become friends with the family living next door, which consists of a mother, a daughter in college, a daughter in high school, and a daughter a year or two older than Yotsuba (the father of the family never makes an appearance). 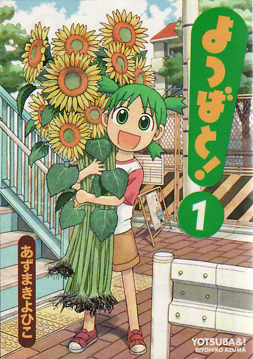 Although other friends of Koiwai and the next-door neighbors are occasionally introduced, Yotsubato! mainly revolves around this core set of characters and their interactions. The manga moves slowly from day to day. Over the course of nine volumes, its leisurely pace has taken it from the middle of summer to the very beginning of fall. What I love about this manga is this very slowness. I wouldn’t describe this work as “contemplative,” however; Yotsuba herself is very curious and energetic, and her adopted father is something of a character as well. There is nothing boring about the manga, but its focus on the mundane allows the reader to take a step back from his or her own presumably hectic life and enjoy an endless summer full of daytrip adventures and small discoveries. This is not to say that Yotsubato! somehow resembles something like My Neighbor Totoro. The manga is written from an adult perspective, and the reader is constantly encouraged to identify with the people who surround Yotsuba rather than with the girl herself. The occasional jokes that the manga makes are sophisticated, and the adult speech and relationships are not sanitized or downplayed. The attention to detail expressed in every aspect of the manga finds its most visible outlet in its gorgeous artwork. As I noticed when I first read the manga in America, it takes Azuma several chapters to settle on his character designs, which are drawn in his unique style. The rest of the visual realm, however, is drawn in an almost photorealistic way, from the tiniest detail of the interior architecture of Yotsuba’s house to the products lining the shelves of a neighborhood convenience store. 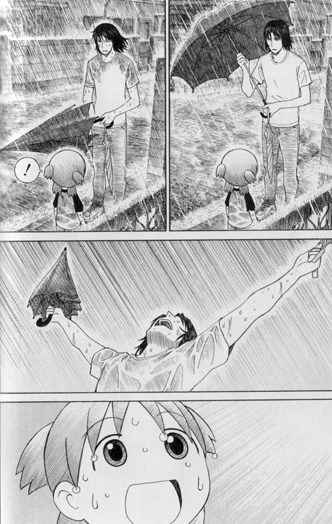 Aside from the shade of Yotsuba’s unique hair, there is almost no screen tone used in the manga; everything is conveyed in understated ink work, which miraculously never clutters the page or busies the panels. The slightly cartoonish characters provide a pleasing contrast to this sort of detailed background. I feel like the background art in this manga captures the essence of a Japanese suburb far away from Tokyo; so, even while I was reading this manga in Yokohama, it made me feel nostalgic for living in Japan. I suppose you could say that I enjoy this manga because of its pace, its narrative tone, and its art. I’m not really sure, though, what makes Yotsubato! different from any other “slice of life” manga, but it is different. I have said before that I think manga can be considered literature, but Yotsubato! is not literature. It is a masterwork of an entirely different medium of artistic expression. Really, I think Yotsubato! stands alongside the works of Urasawa Naoki and Asano Inio as an exemplar of what manga is capable of. Although I am a great believer in translation, I feel that Yotsubato! is much more enjoyable in the original Japanese. Thankfully, even beginning students of Japanese should not find the dialog in the manga to be prohibitively difficult. For those readers who have no Japanese language background, however, a new English translation of the manga is currently being published under the title of “Yotsuba&!” by Yen Press. I think the following two pages demonstrate the style of the manga. 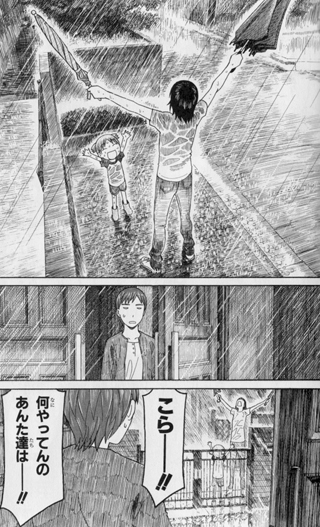 In the middle of a late summer typhoon, Yotsuba runs into the storm to warn her next door neighbors to be careful. In her haste, she forgets her umbrella, so her adopted father runs after her to give it to her. Upon catching up with her, he finds her already drenched, so…. Posted in mangaTagged ADV Manga, Asano Inio, Azuma Kiyohiko, Azumanga Daioh, comedy manga, four panel manga, ink line artwork, literature, manga, manga as art, manga as literature, Shibuya, slice of life manga, suburbs, the best manga ever, translation, Tsutaya, Urasawa Naoki, Yen Press, yon-koma manga, Yotsuba&! I always wondered what that panel was from. It’s really hard to explain that genre to new readers. I’m always at a loss about Azumanga Daioh! because if I say, “It’s about some girls in middle school and it’s really funny,” it fails to articulate the subtle and not-so-subtle wackiness of the show. Which I need to finish watching. I’m going to die when I no longer have easy access to Book Off. The end of Azumanga Daioh made me cry and cry and cry. Not because it was sad, but because it was so beautiful. I wish my high school experience had been like that. It’s just a light-hearted, silly show, but it made me think a lot about memory and nostalgia, and about what experiences in our lives are important, and about how we choose to remember them. Also, I thought I would die when Sakaki-san finally gets a kitten. She is my hero. Thank you for your review. BTW, the neighbour’s father does appear rarely e.g. in Vol 3 Ch 20, where eldest daughter Asagi doesn’t recognize him. A few pages of banter between father and daughter ensues.